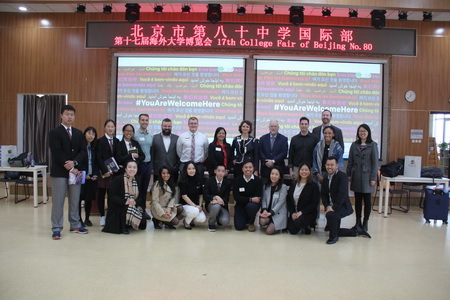 In October 2018, the international department has successfully held two oversea college fairs, bringing college representatives from over 50 universities, such as Duke, UC-Irving, University of Edinburgh, to the campus, creating wonderful opportunities for face-to-face interaction for both students and teachers. The first college fair was scheduled on the morning of October 15th, with 45 participating colleges around the globe. 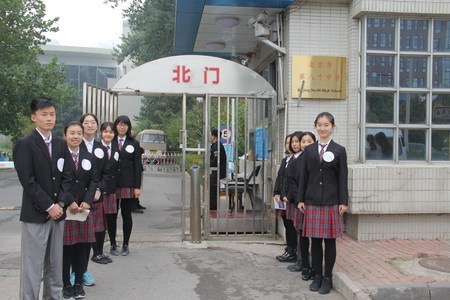 At 10:00 pm, student volunteers warmly welcomed the oversea guests at the school gate to lead them into the reporting room for the opening ceremony. 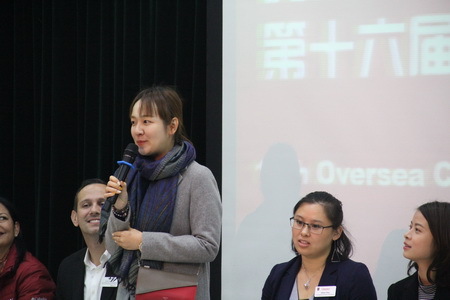 The opening ceremony began at 10:20 in the reporting room, hosted by international teacher, Marie. 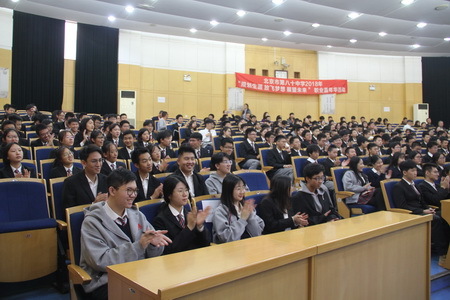 The college representatives gave impressive introduction about themselves to the exciting audience, who replied with rounds of applause and cheering. 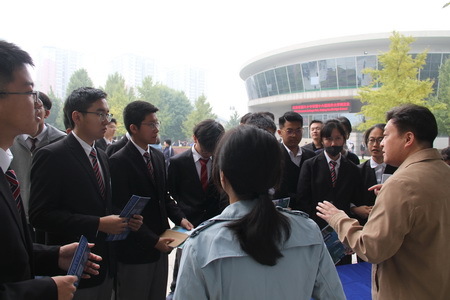 After the opening ceremony, the college fair proceeded in full swing at the campus square. College representatives introduced in detail every aspect of their universities and also give special attention to the questions brought by the active students who gathering around each table and listened attentively. 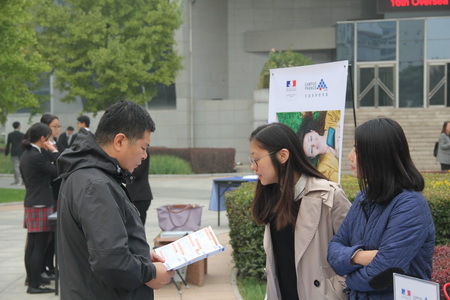 In the meantime, the student volunteers engaged with each college representative with fluent English to collect their contact information and give out presents on behalf of Beijing No.80 High School. 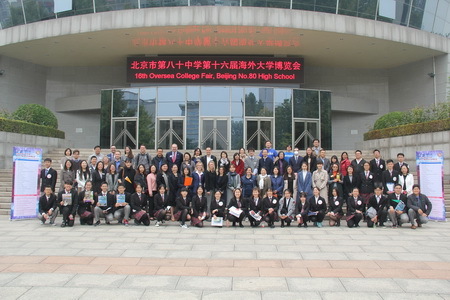 At 12:00 pm, the college fair wrapped up successfully, with students orderly led away by teachers, while volunteers stayed behind to assist clean-ups and gathered for a final group photo-shoot with college representatives in front of the school auditorium before bidding farewell to the guests. 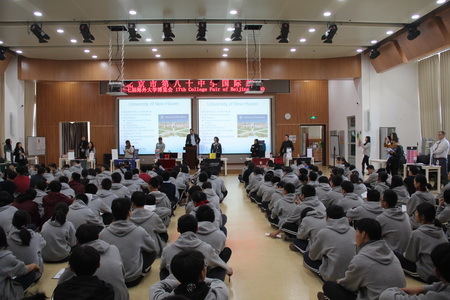 On October 23th, the second college fair was held at 411, where representatives from 13 US colleges provided valuable information to Sino-US students from Grade 10-Grade 11. After the brief opening speech and introduction, college representatives chatted with students on every aspect of their universities and had in depth discussion on topics of students’ concern. In the meantime, student volunteers worked diligently to collect contact information and give out presents on behalf of Beijing No.80 High School. The fair ended at 12:00. Students had a rewarding experience in not only acquiring information from college of their interests, but also in having a deeper knowledge of their future path, and thus marking the great success of the events. 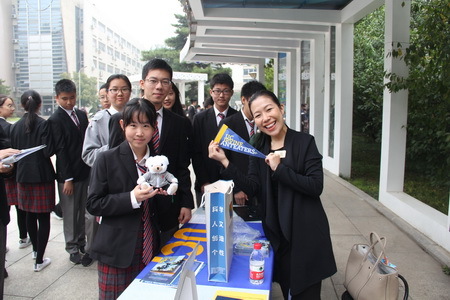 The two successful college fairs have provided students a valuable chance to learn about a diversity of colleges around the world and enabled them to gain a more specific view on their own professional development and college planning. Many students said their path had become clear and their confidence for the future boosted by attending the events. 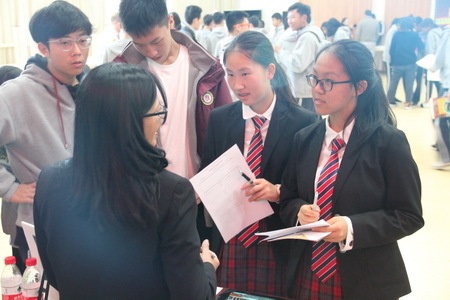 The college fairs also provided parents opportunities to interact with oversea colleges. A mother of a 9th grader said she had learnt a lot about college applications during the events. The student volunteers also played a crucial role in the success of the two events, demonstrating the excellent quality and strong sense of responsibility of No.80 students.